If using fresh blueberries, rinse well and lightly pat dry. If using frozen (which is what I did), thaw and drain the liquid off. 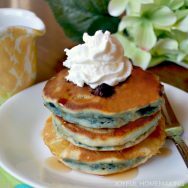 (If you don’t thaw them, their “frozeness” keeps the pancake batter from cooking well, so don’t do that). Stir together the dry and wet ingredients. Gently fold in the blueberries. Cook over medium heat in a greased (I use cooking spray) frying pan. I use a 1/4 cup measuring cup to measure out the batter into the pan. When they start to get air bubbles on the top, and golden on the bottom, they’re ready to flip. Cook till golden brown.